Who the Heck was Homer? On August 3, 2019 during Silverton’s annual Homer Davenport Community Festival, The Davenport Project heads over to the Silver Falls Public Library for our next free presentation, staring at 1:30 (and repeating at 3:00), sponsored by the Silver Falls Public Library. 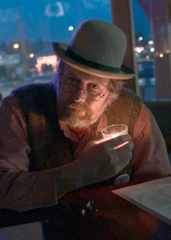 On tap will be a lively and visually entertaining presentation, on the life and times of political cartoonist Homer C. Davenport, late of Silverton. In the decade of the 1890s, just before the dawn of a new century, American society was going through a transition; from horses and trains to automobiles and airplanes. Change was everywhere. Through it all, Oregon-born cartoonist Homer Davenport was there, wielding his pen to spray a steady stream of caustic caricatures onto the notables and notorious of the global political scene. 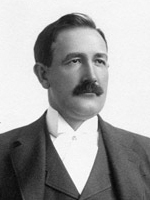 Homer Davenport (1867-1912) was Oregon’s first media super-star. Born in Silverton, Oregon, into the pioneer Davenport and Geer families, he became a world traveler and developed a second career of breeding Arabian horses. His life is a story of fame, political influence, family connections, artistic creativity, and discovery. Yet, few outside his hometown are even aware of the impact this self-described “country boy” had on society. His unique rural Oregon upbringing, along with a supportive and nurturing home life, equipped Davenport with the intellectual tools and the artistic skills needed to hit the ground running, in spite of—some would say because of—a lack of formal training. He arrived on the scene during a perfect storm of technology and public sentiment. One New York State Senator even sponsored a bill to outlaw political cartoons, because of the influence of Davenport’s work. For this presentation, Davenport historian and Oregon Cartoon Institute fellow Gus Frederick will present a visual overview of Davenport’s art, life and times. With emphasis on the enabling reprographics technology of the era, as well as a snap-shot of Davenport’s contemporaries, Frederick will show graphically how the turn of the Twentieth Century was the golden age of the cartoonist and graphic illustrator. And how a small-town Oregonian occupied a major role. Also included will be an update on the eight recently acquired original Davenport cartoons, an exhibit featuring the City of Silverton’s collection of cartoons, and of course Silverton’s annual Homage to its favorite son, the Homer Davenport Community Festival. Frederick is the creator of The Annotated Cartoons by Davenport, an annotated edition of Davenport’s 1898 collection of cartoons, as well as Silverton from Arcadia Publishing’s Images of America series. He also compiled the extensive social commentary of The Collected Works of T.W. Davenport, comprising Homer’s Oregon pioneer politician father’s writings from the Oregon Historical Quarterly. Additionally, he is continuing work on a video documentary of Davenport’s life and times. The Silver Falls Public Library is located at 410 South Water Street, in Silverton. Doors open at 1:00 p.m. with the presentation starting at 1:30 p.m. and repeating at 3:00 p.m. Free and all ages are welcome! On January 28, 2014, The Davenport Project heads over the Cascades again to present a talk entitled “T.W. Davenport: Experiences of a NE Oregon Indian Agent” at the History Pub. The free presentation will be held in the Father Luke’s Room at the McMenamin’s St. Francis School in Bend. It focuses on Silverton pioneer Dr. Timothy Woodbridge Davenport (right), father of the famous political cartoonist and his experiences serving as a temporary Indian Agent at the Umatilla Agency during the Civil War, as well as other encounters with Native Americans he had over the years. Taken from his own extensive four-part series first published in the Oregon Historical Quarterly in 1907, Dr. Davenport’s recollections are an incredible glimpse into an often unknown era. An abolitionist and charter member of the Oregon Republican party, Dr. Davenport, was a very remarkable person. He was a medical doctor, pioneer farmer, surveyor, Indian agent, store owner, state legislator and state land agent. He was born on July 30, 1826, in Columbia, New York. The Davenport family left New York and settled in Ohio for several years. In 1851, the family headed out to Oregon Territory by wagon train. They arrived in the Silverton Country, in the fall of 1851, and established a donation land claim in the Waldo Hills South of Silverton. Dr. Davenport gave up his medical practice to concentrated on surveying, a skill much in demand in the pioneer Willamette Valley. In his later years, he took to writing. He was a distinguished member of Silverton’s community leaders, earning the nickname, “The Sage of Silverton” for his incredible intellect and humanity. Over a period of several years in the early part of the 20th Century, he contributed over a half dozen papers to the then-new Oregon Historical Society. “Recollections of an Indian Agent” of which this talk is based, as well as the two-part “Slavery Question in Oregon” are long-lost gems of historical perspective from Civil War era-Oregon, eloquently written by someone who was there. And Dr. Davenport found time to raise a family, that just happened to include William Randolph Hearst’s leading political cartoonist, Homer Davenport. A collection of Dr. Davenport’s writings converted to Adobe Acrobat files are available from “The Homer Page.” As you will soon discover, the Davenport family story is both wide and deep. Presented by The Davenport Project’s Gus Frederick, this highly visual presentation will take you back to the Oregon of the Civil War era. Doors open around 6:00 with the talk starting at 7:00. The Old St. Francis School is located at 700 N.W. Bond Street in downtown Bend, Oregon, and is sponsored by the Des Chutes Historical Museum, Oregon Historical Society, and the Oregon Encyclopedia. The GeerCrest Farm family invites you to join us at GeerCrest Farm on April 7 at 6:00 pm, for our Spring Farm Dinner. Guests will experience a seasonal, 4-course feast made from farm fresh fare, skillfully paired with regional organic wines, and prepared with love by the GeerCrest Farm family. This evening is an occasion to taste the local flavors of the growing season, while supporting GeerCrest Farm in the company of your friends and neighbors. For this dinner program, we will be featuring a talk by GeerCrest Board member and Davenport Project lecturer Gus Frederick, on the life and times of Oregon Cartoonist Homer Davenport, as well as the contributions to pioneer Oregon by his Geer and Davenport relatives. 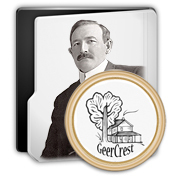 GeerCrest Farm began as a homestead in 1848 by Mary and Ralph Geer. Through the last Century and a half, the land has remained a working farm and has been handed down through successive generations of the Geer Family. Recognizing the tremendous legacy the land and historic farmhouse hold, including sanctuary to Homer Davenport, the W.R. Hearst Political Cartoonist, a group of volunteers formed to preserve the farm and way of life. Today, GeerCrest Farm & Historical Society’s mission is to live and teach agrarian culture, encouraging people to rely on each other and cooperate with nature to provide a livelihood for themselves. GeerCrest invites students of every age to visit the farm and learn farming skills including caring for goats, sheep, pigs, horses and chickens as well vegetable and fruit culture, cheese-making, canning, and much more. Students stay for the day on field trips, the week as part of school curriculum and summer farm stays, or a weekend up to several months as a farm family member. Help support GeerCrest’s Legacy of Education, Preservation and Agrarian Culture today by reserving your tickets. The dinner is $60 per plate, and includes local libations. The event is limited to 30 folks, so reserve your seat at the table today by registering Online at the GeerCrest site, or by calling GeerCrest Farm at 503-873-3406. For the next “Dining in the Dark” Forth Sunday Candle lit Dinner at the Seven Brides Taproom in Silverton, The Davenport Project’s chief lecturer will give a recitation of the classic American poem, “Casey at the Bat.” If time and the audience permits, we may offer up the Garrison Keillor “Road Game” version as well. Davenport, a longtime baseball aficionado since his teen years in Silverton, was a close personal friend to Albert Spalding, the sporting goods magnate. He hired Davenport to illustrate his 1911 baseball history book, “America’s Favorite Game” with 17 cartoons, including an homage to “Casey” and the orator that first made it famous, De Wolf Hopper. The poem was made famous by the late 19th century comedian De Wolf Hopper, who made “Casey” his signature piece. Like Davenport, Hopper is relatively unknown today. His son Bill Hopper on the other hand, is fondly remembered on re-runs of Perry Mason, as the private detective Paul Drake. Below is the back story of Casey, from the Baseball Almanac Website. 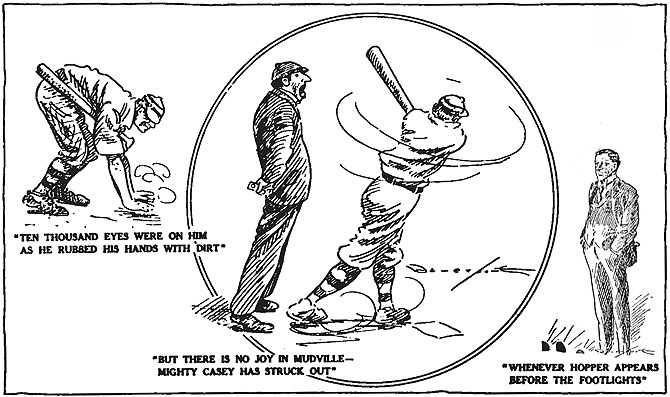 "Casey at the Bat" illustration by Homer Davenport for A.G. Spalding's book, "America's Favorite Game." It all started in 1885 when George Hearst decided to run for state senator in California. To self-promote his brand of politics, Hearst purchased the San Francisco Examiner. At the completion of the election, Hearst gave the newspaper to his son, William Randolph Hearst. William, who had experience editing the Harvard Lampoon while at Harvard College, took to California three Lampoon staff members. One of those three was Ernest L. Thayer who signed his humorous Lampoon articles with the pen name Phin. In the June 3, 1888 issue of The Examiner, Phin appeared as the author of the poem we all know as Casey at the Bat. The poem received very little attention and a few weeks later it was partially republished in the New York Sun, though the author was now known as Anon. A New Yorker named Archibald Gunter clipped out the poem and saved it as a reference item for a future novel. Weeks later Gunter found another interesting article describing an upcoming performance at the Wallack Theatre by comedian De Wolf Hopper – who was also his personal friend, (illustration right, by Davenport). The August 1888 show, exact date is unknown, had members from the New York and Chicago ball clubs in the audience and the clipping now had a clear and obvious use. Gunter shared Casey at the Bat with Hopper and the perfomance was nothing short of legendary. Baseball Almanac is pleased to present the single most famous baseball poem ever written. Click to hear De Wolf Hopper recite Casey at the Bat. First TDP Event a Success! 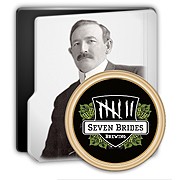 Silverton, OR: The Seven Brides Taproom in Silverton, Oregon hosted the first official event of The Davenport Project. 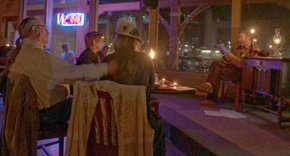 On Sunday evening, January 29, The Taproom presented it’s first “Dining in the Dark” special evening. “Several months back, Silverton experienced a power outage that lasted several hours;” explained Seven Brides owner Jeff DeSantis. “We had candles and a gas grill, so we made the best of the situation, and folks loved it! So we decided to make a monthly special out of it!” he added. During the evening, the electric lights were turned off in favor of candles, oil lamps and lanterns, imparting a sense of “Homer days” from the 1800s onto this heritage dining experience. Into this mix, Gus Frederick from The Davenport Project presented a dynamic reading of “Homer Davenport – By his Father.” Written in 1899 for the magazine, “Oregon Native Son,” by Timothy W. Davenport, Homer’s father, it offered an interesting glimpse into the minds of both Davenports, the younger and the elder. Frederick paced his presentation with a musical interlude prior to and midway through the reading, provided by period music originally released on shellac analog audio disks, (78rpm records), played back on Frederick’s Orthophonic Victrola acoustic gramophone. For the first quarter century of recorded music, gramophones and phonographs used spring-wound motors and a hollow “tonearm,” that reproduced the music mechanically without electricity.